Recently I've taken a liking for flying the spacecraft in Space Engine. 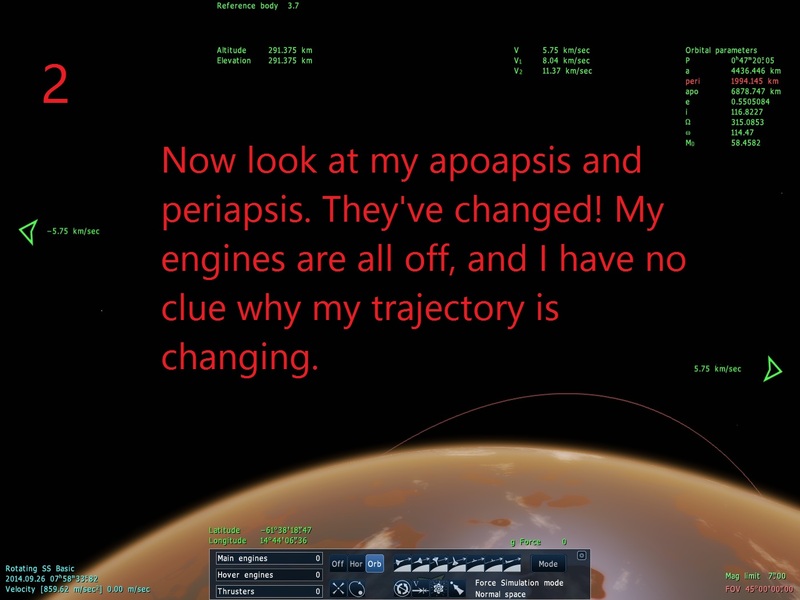 I've gotten the controls down well but one problem still bothers me when flying around planets and moons: my orbit will not stop changing. Even with engines all off and in the vacuum of space somehow my apoapsis and periapsis still move around. This has made flying spacecraft nearly impossible and extremely rage-inducing. I learned the basics (and somewhat advanced parts of) orbits and velocities from good old Kerbal Space Program, yet I don't have a clue why my trajectory will not stay still. Now, don't get me wrong, for as realistic KSP is it does have flaws. One hypothesis I have is that maybe a planet's moons are affecting my orbit. But that's about all I could possibly guess. Am I missing something? I don't know if this is a glitch or simply a part of orbital mechanics I haven't learned yet. I know there is "Force Orbit" mode, but I'd still like to fly around "off-rails." So, if any of you know anything that could help me get stable orbits that would be terrific. I noticed this a lot of times too, and it kind of annoyed me as well since it made stable orbits around moons practically impossible. I think that this is because of the gravitational effects of other nearby bodies, since SpaceEngine uses n-body physics(realistic) unlike KSP. So...not a glitch? Do I have to deal with this? If you click the "Mode" button, it'll lock you to the body you're currently orbiting, with your current orbital parameters. It's not without it's bugs, though, as it will usually transport you to a different point on the orbit, and disables your ability to manoeuvre. disables your ability to manoeuvre. You can still adjust the crafts rotation, which is good since the craft may spin wildly when you resume your game. Yep. You can see the same effect in Orbiter, when orbiting the Moon, for instance. Even more profound for the Galilean moons. Orbiter also has a little display telling you what percent contribution to the local gravitational field comes from the object you're closest to. Basically a quick way to visualize your location within the Hill Sphere. I really liked that; could be a cool feature to have in SpaceEngine. There's also the fact that spaceflight physics are an unfinished feature, so you should expect problems. Orbits will behave more appropriately when development is finished. Thanks guys! This definitely has clarified a lot. I thought that's the floating-point(or fixed-point?) error. So I was wrong? I don't think so -- one does not need a tremendous amount of precision to well specify an orbit around an object. The orbital changes seen here are caused more by other effects mentioned above. Floating point error is more apparent when the object is very far from the center of the coordinate frame, and can cause jerky movement. I have flown and orbited the moons of Jupiter no problem in Orbiter Space Flight Simulator lots of times, and yes even orbiting around Io at ~100Km altitude was good. Yes, gravity from the other moons changed my orbit very slightly over a long time. But its absolutely nothing to the amount that space engine messes me up. Even a nice low orbit around Callisto messes me up in space engine, spiraling away from it entirely after about 20 ish orbits, all engines off. not to mention the annoying selected orbiting object automatically switching to the nearest object all the time. I am going to say indeed that space engine spacecraft orbits are broken right now. I trust the orbital physics in Orbiter Space Flight Simulator more then SE at this point. Hopefully they will work better in the future as SE improves naturally.